Things we did today...: Celebrity Sighting! Sometimes I wonder if there is anyone out there reading our blog posts besides other Bloggers... I know I follow a number of other sail-related Blogs and have done so for years. Although they are all just regular people, like us...(finally) meeting them in real life is kind of like a celebrity sighting for me! Through the interwoven web that is the Internet, we were able to hook up with yet another fellow Blogger, this time in New Orleans, LA. (Our first Blogger meet-up was in Clear Lake, TX. 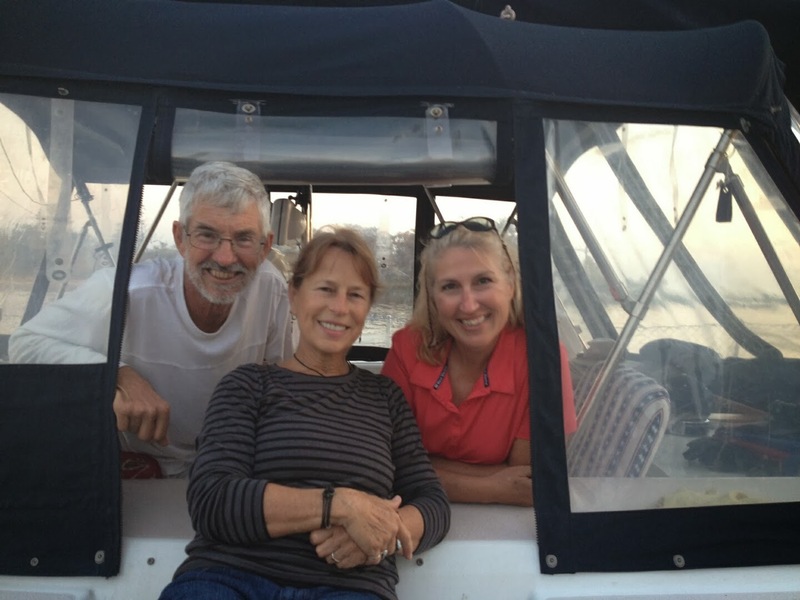 with Janet Lee and Michael from Adventure US 2) Coincidentally, Sundowner was in the marina where we ended up stopping for a couple of nights for fuel and some repair work. Turns out, that was Dani and Tate taking their boat for a haul out in preparation for the final push in their refit. They plan to toss the dock lines in about a year! We made contact through Facebook and invited the Cruisers-In-Waiting over for a Texas style dinner! It was wonderful to have something to occupy my mind while we waited (all day) for the technician to arrive to fix our autopilot. I wanted to serve them something from Texas, as much for myself as for them... I made King Ranch Turkey and Spanish Rice. My dinner party skills have become a little rusty and it was nice to cook for someone other than ourselves. We talked Cruising and all-things-boaty through dinner and beyond. I see so many similarities between us and truly admire Dani for her willingness to get right in there and get dirty. It is as her dream as well as Tate's to go cruising and her excitement shows in every blog post she writes. It is the people we meet along the way that are making Cruising such an enriching experience and I am happy to move Dani and Tate from Facebook friends/Blogger, to Friends IRL (in real life)! I'm sure our paths will cross once again! Totally random! We met Dani's Mother in Mandeville! Update: Even more coincidentally, Bruce and I met a couple on the dock in Mandeville, LA. a couple of days later... Turns out the woman was Dani's MOTHER!!! Small world! Hey! So nice to meet you and Bruce :). What an amazing conicidence you met my mom up there, LOL. Really. I hope you have a GREAT time in Mandeville. BTW the sail across is so nice as you have experienced and it's normal to lose wind about mid way. It's flukey. We've had just such a great time meeting people and the coincidence is so incredible, I feel like we're in one of those reality shows where they throw weird stuff at the characters just to see what will happen. The sail was great and I hope to get to see your mom again too. We packed quite a lot into those few minutes! See you out there!